Last night we had a wonderful evening aboard the charter yacht, Hanalei Bay, while we are still in St. Thomas, US Virgin Islands. We had a simple, but SUPERB, meal of pork stew with sides of rice, potatoes, and mixed vegetables. Diane made a wonderful chocolate cake that I have been longing for... perfect! Thanks guys, for having us over. Hanalei Bay is currently available for Christmas 2007! or how about spring break with the family? Promenade Opening - Hot off the press! BAD NEWS: Promenade, the 65-foot superfun trimaran with a wonderful crew, has had a cancellation for the week of June 12-19, 2008. GOOD NEWS: Promenade is now available for this primo week for YOUR charter. The kids will be out of school and this is a great boat for families, too! 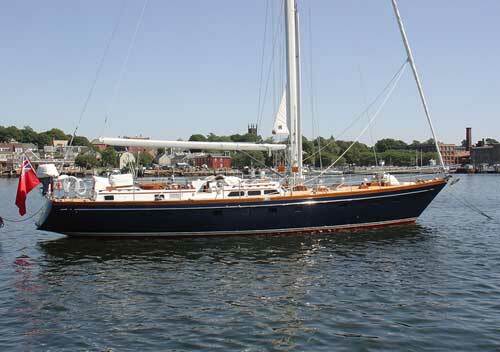 We visited the 62-foot Little Harbor sloop, Conundrum at the St. Thomas Charter Yacht Show on Saturday. It is a beautiful yacht. We were just leaving when the captain returned to the boat. He looked at Bob and said "Loose Moose 2! Bob & Sheila". We were shocked! How does he know Loose Moose? "IT IS A CONUNDRUM... SO MUCH TO DO, OR SO LITTLE TO DO! Is your idea of a dream vacation to pack in everything possible, every day? Exciting ports of call and trendy beaches, interlaced with the thrill of slicing through the ocean water while under full sail? Take the helm yourself, or just sun and enjoy the view. Or is your idea of the perfect getaway to slow down and take each day as it comes? Enjoy the peaceful morning breeze from the sundeck, wander an island trail, and relax with a drink to enjoy the romantic sunset? Either way, or a little of both, is perfect for us if it's perfect for you. We enjoy providing exactly the experience that is right for you. Gourmet food using exotic and fresh local ingredients? Meat and potatoes? The answer is YES, we can do that. Remember: When deciding which sailing yacht to charter, it's not a conundrum... it's THE Conundrum... because we create the vacation experience you desire." Hi! Sorry for the lack of posts as we have been attending the two charter yacht shows in the Virgin Islands this week and we haven't had much spare time or decent internet access until today (hurray!). We just successfully signed up and now have good wifi on the boat so WATCH OUT! Sorry about the slow reply, but we have been busy in the boatyard getting ready for the season. We spent most of our summer in New Mexico visiting family and friends. A lot of our time was spent "working on our music." We have been adding songs to our repertoire, and learning some new techniques and playing styles for ukulele and harmonica. We don't have any photos, but we did add a music page to our (no-contact) website that has links to a couple of mp3s and a video. The link is www.YachtQwest.com/music.html . We hope to add some more stuff to the page, but right now things are crazy busy!!! QWEST is still available for both Christmas AND New Years! 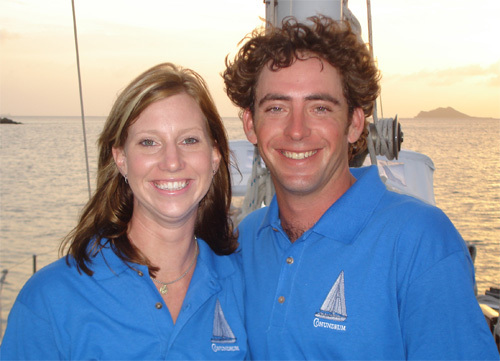 Charly & Carolina of the charter yacht Crystal Clear, are ready to welcome you aboard for a yacht charter sailing vacation this season. BOOK YOUR HOLIDAY PARTY ABOARD EASTERN STAR! 'Tis the season to enjoy a private, exceptional cruise aboard the m/y Eastern Star. EXPERIENCE STUNNING VIEWS, FINE CUISINE, AND GREAT ENTERTAINMENT! Package rates do not apply to Thanksgiving, Christmas, and New Years. Rates are available upon request.